How Does The Bible Define Patience? It is no secret that technology and innovation has made routine tasks easier and quicker. We now have restaurants that can produce a family size meal for drive-through customers in seconds. We also have cameras on police officers, news coverage, and personal cell phones that record events on the ground as they unfold. With these innovations and other advances, an expectation has been set that we should no longer have to wait to get what we want or make judgments about right or wrong. For this reason, it is good to reflect on how does the Bible define patience? Patience is part of the fruit of the Spirit (Galatians 5:22). What is the common definition of patience? Patience is commonly defined as (1): “the capacity to accept or tolerate delay, trouble, or suffering without getting angry or upset.” It historically comes from the Latin, patientia, meaning suffering, which also gives us the word patient, referring to someone who is suffering from being sick or injured. Today, the use of the word patience is at its lowest point than any other time in the last 500 years of recorded history. This is a telling commentary on how society as a whole stands when it comes to patience. The Bible defines patience in a similar way, but with additional aspects. In addition to the simple use of the word patience, when it comes to suffering, the word longsuffering is sometimes used (KJV). When it comes to continuing through adversity, the word enduring may be used. In all cases, the idea of patience in the Bible covers the same aspects as the common definition. It is clear that patience is a virtue from God. With Biblical literacy being at such a low point, it is no surprise that there is such a lack of patience in modern society. 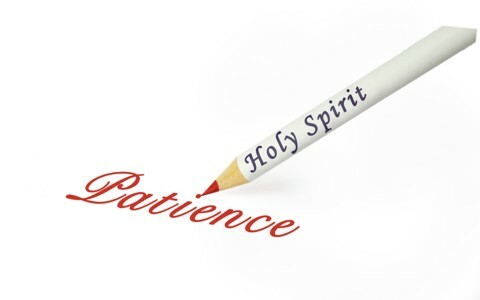 Like all the other aspects of the fruit of the Spirit, patience is yet another barometer of our relationship with God. Unfortunately, lack of patience has led to many situations where poor decisions have been made and injustices have taken place. With continued drifting away from God’s Word, calling for patience by anyone often leads to accusations that someone is deliberately trying to cover something up. Likewise, the lack of patience has led to a vigilante mindset that demands people be fired or officials be jailed because of an unwillingness to wait to gather all the facts before rendering a judgement. Then, later, when the facts do not bear out the hasty verdict, no mercy is extended to those who were wrongfully accused (Romans 1:28-31). God addresses this in Proverbs 18:13, 15, 17, 19; James 1:19-20 and James 3:13-18. Patience is commonly defined as “the capacity to accept or tolerate delay, trouble, or suffering without getting angry or upset.” Patience, sometimes referred to as longsuffering, originates from God, and is part of the fruit of the Spirit. It is a product of self-control and a part of Godliness, which was demonstrated to us by Christ. Patience is an important part of helping us grow and become stronger in our faith during trials. Our patience pleases God and results in His blessing. Finally, the lack of patience demonstrates ungodly thinking that is without the protection and knowledge of God and leads to injustices and unmerciful treatment of others.